In the future, can high-strength screw connections with completely coated components be reliably implemented without extensive and expensive masking? Together with the screw connections research group of the faculty for mechanical engineering and process engineering at Offenburg University, FreiLacke has been conducting user-oriented research for more than two years and further develops selected system coatings with regard to their properties as «machine elements». The cooperative research project, which is sponsored by BMWi as part of the Central Innovations Programme for Medium-Sized Companies, focuses on the question of whether coating layers can remain in the head and/or nut contact area as well as in the joints and, if yes, under what conditions. In order to provide computational proof of the operational security of screw connections with coated components prior to the application, the loss of preloads in relation to different wet coating or powder coating systems, different assembly preload levels as well as different temperatures are analysed. Furthermore, the friction conditions that predominantly exist at the contact surfaces referenced above are decisive for the level of the assembly preload and for whether the screw assembly can be conducted with repeated accuracy and reliably. That is why this project determines the friction coefficients according to DIN EN ISO 16047 for the various systems. The friction characteristics in the joints between the clamped components are the key to safe operation with high fatigue resistance. 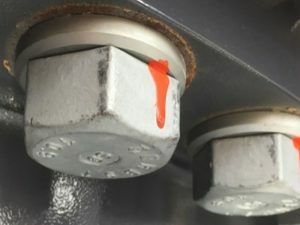 Current standards and guidelines in general mechanical engineering do not regulate the handling of organic anti-corrosive coating layers in the flow of forces of screw connections. In particular, the internationally recognised guideline VDI 2230 for the «systematic calculation of highly stressed screw connections» excludes organic anti-corrosive coating layers. In steel construction, however, this topic was taken up as far back as the 1998 edition of the international standard DIN EN ISO 12944 with regard to «corrosion protection of steel constructions via coating systems». The standard mandates that «a coating material with a suitable coefficient of friction may be applied to the friction surfaces». However, «coating systems that do not lead to an impermissible reduction of the preload are to be used». Information on suitable friction coefficients or a permissible reduction of the preload is not provided. Furthermore, «screws, nuts and washers are to be protected against corrosion in a way that corresponds to the duration of corrosion protection for the entire building». In DIN EN 1090-2 on the «execution of steel and aluminium structures», a lot of information on mechanical connections is provided. In addition to instructions for determining the static friction coefficient, there are also specific percentages regarding the «potential loss of preloads of coatings/coating systems in combination with pre-stressed contact surfaces». However, this information refers to steel construction specific test setups and experiments conducted at room temperature and test objects that were tightened in purely torque-controlled manner. That is why this information is not directly applicable to the many applications and designs in mechanical engineering, plant construction and vehicle construction. Summary: In mechanical engineering and vehicle construction, there are currently no guidelines or standards that regulate the handling of coating layers in the flow of forces of screw connections. This leads (see image A) to uncertainty with regard to handling this topic. Due to missing specifications, the screw head surfaces of screw connections in practice are, for example, laboriously and expensively masked, in order to ensure that no coating remains. This, in turn, can lead to critical losses of preloads. This, however, leads to a newly coated machine showing the first traces of corrosion only a few hours after being coated with a high-performance coating. If it is a connection with high-strength screws of the strength class 10.9 or higher, there is even the risk of potential corrosion during operation, the so-called hydrogen embrittlement of the screws, and therefore the sudden failure of the connection during operation, which can have extremely critical consequences to life and limb. In order to analyse this issue and find solutions, a consortium of businesses including FreiLacke gathered at Offenburg University. In addition to LIEBHERR WERK EHINGEN GMBH, a well-known manufacturer of mobile construction machinery, they included HYTORC® und SMARTTORC®, the manufacturers of intelligent screw assembly systems and tools for high torque ranges. An evaluated method of testing for measuring losses of preloads, depth of penetration and friction coefficients of coated components was developed. Individual coating systems that were tested demonstrate a very high mechanical strength. The coating layers remain intact and keep their anti-corrosive properties even after being tightened beyond the elastic limit. The coating systems that were used vary, and at times significantly, in their propensity for abrasion and their friction coefficients. These properties can be influenced via the recipe. The friction coefficients are rather in the friction coefficient class A than B according to VDI 2230-1. In this project, powder coatings initially proved themselves to be significantly more resilient than wet coatings and demonstrated a higher wear resistance as well as a lower loss of preloads. However, under certain conditions, wet coatings can achieve similar results. Higher layer thicknesses and operating temperatures lead to higher losses of preloads. During a quasi-static application below critical temperatures, it can generally be expected that the losses of preloads will remain low when the head and nut areas feature coating layers. In total, the losses of preloads during the previous tests were below ten percent, which means they almost achieved the behaviour of coating-free connections. Corrosion protection remains in place if the coating was applied during clean conditions, even after bolting. This could be detected from the visual inspection. However, subsequent tests will also include the proof of the salt spray test according to DIN EN ISO 9227. The type of advanced cyclic tests that are common practice for offshore applications, for example, should also be conducted in relation to individual applications. As the only currently known hydraulic unit, the screw assembly system from HYTORC® and SMARTTORC® is able to tighten the analysed coating layers within the flow of forces – with repeated accuracy and limit value controlled. The limit value controlled tightening process is able to analyse any screw connections with regard to their potential. This allows material, surface and process problems to be detected early. The friction in the screw connection, which is potentially caused by the system coatings, does not affect the process result of the preload. The screw connection can be utilised optimally. You can get additional information on the results of the cooperative research project from Offenburg University (Mr. Dietmar Isele at dietmar.isele@hs-offenburg.de) or from Emil Frei GmbH & Co KG (Dr. Jörg von Seggern at j.vonseggern@freilacke.de).